Dogs Were Used for Shark Bait by Fishermen on African Island-Truth! - Truth or Fiction? Dogs Were Used for Shark Bait by Fishermen on African Island-Truth! Dogs Were Used for Shark Bait by Fishermen on African Island–Truth! A forwarded email warning that dogs are used as shark bait by fishermen on the island of Réunion that lies off the coast of Africa. It includes a plea to sign a petition to stop this cruel act. The article said that Reha Hutin, the president of Paris based Foundation 30 Millions d’Amis (the Thirty Million Friends Foundation) sent a film crew to the small volcanic island to document claims that live animals were being used by fishermen to catch sharks. They discovered that stray dogs and cats on the island are viewed as vermin and the foundation plans to finance a sterilization program to reduce the population of strays. This still video photograph was in the National Geographic article taken by Thirty Million Friends Foundation. This dog managed to escape fishermen before it could be used as live bait and was lucky enough to be found and taken for medical attention. 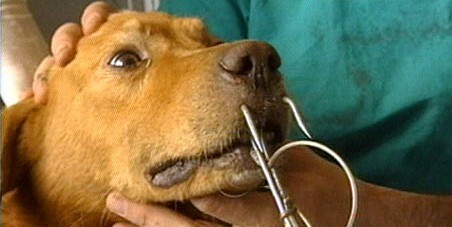 He is shown here as a veterinarian prepares to remove the hook from it’s snout. The operation was a success and the dog is now at home with its owners. This barbaric act isn’t just as simple as running a hook through the stray animals and tossing them over the side of their boats. In order for the fishermen to entice the carnivorous predators off their coast they hook the dogs snouts and paws and let them bleed out for at least a day. In September of 2005, the government of Réunion responded to the outcries by passing into law a bill that would make it illegal for fishing boats to carry any dogs or cats, alive or dead. Shortly after the law was enacted the article said “the first court case was held involving a person charged with using live dogs as bait. Authorities had found a seven-month-old puppy on John Claude Clain’s property in July with three fishing hooks in its paws and snout.” This resulted in a 5000 euro fine for Clain. SIGN the PETITION, SAY NO and Send it around. On the island of Réunion it has been recently found that dogs are being used as live shark bait. through its nose. If you have a heart you’ll pass this on… these little guys need your help!! how can u say no?? Hillary Clinton’s Accomplishments as Secretary of State-Fiction! ESPN Failed to Show Veterans Salute at Lambeau Field-Truth! & Misleading!